Lausanne, 12 March 2015 – IBS Intelligence, an independent publication covering the financial technology industry, annually releases its Sales League Table report based on the sales results of various global vendors catering to the industry. IBS Intelligence surveyed software vendors and based on their 2014 sales, SAGE’ Prospero emerged, for the 3rd year in a row, as the 2nd best selling software out of 8 solutions in the area of private banking. “Ranking among the two best-selling private banking solutions for the third consecutive year confirms Prospero as the platform of choice for institutions that share our passion for smarter systems that are simpler to operate,” said Jean-Luc Freymond, CEO of SAGE Group SA. Lausanne, 24 February 2015 – Treppides Fund Services has recently gone ahead with the conclusion of two very important agreements as part of its expansion of operations. According to the company, these deals mirror its prominent position as a service provider in the field of Investment Funds. One of the agreements pertain to the Prospero Fund software for the provision of administration services and accounting valuations for Investment Funds. The agreement was signed with Swiss company SAGE Group SA, which is one of the top software system providers and which has great experience in Mutual Funds, fund management, and custodian companies for the provision of the Prospero Fund software. The Prospero Fund software is based on a powerful platform which allows users to manage the investment fund’s assets in the most optimal way. The software has been designed for the effective and simple automation of all functions, including transactions, corporate actions and investor record keeping. Furthermore, it ensures compliance with all the international rules and regulations that govern investment funds. Treppides Fund Services Ltd was founded in 2012 with the prospect of providing professional services of the highest level in a wide range of Investment Funds. The company provides a plethora of services such as design, tax structure, application authorization preparation, accounting services, compliance services, advisory services and other investment fund services. With the addition of the new software, the company aims to provide an even higher level of services and to ensure that all mandatory procedures are in place. The deal will confirm the professionalism and reliability of the company as a leading service provider in Investment Funds. *This article was originally published in Greek at IN Business News on 11th February 2015. Published text translated in English has been adapted for its significance to SAGE Group SA. Lausanne, 27 April 2014 – Based on the January-December 2013 sales of all software vendors surveyed by IBS Intelligence, SAGE’ Prospero is still the 2nd best selling software in the private banking space. IBS Intelligence, an independent publication covering the financial technology industry, annually releases its Sales League Table report based on the sales results of various global vendors catering to the industry. In this year’s report published in March 2014, Prospero came out as the 2nd best selling software, out of 7 solutions, for private banking. “We greatly value the confidence that our new clients have placed in us. We share their passion for excellence and welcome them to the Prospero community. We really look forward to helping them succeed” said Jean-Luc Freymond, CEO of SAGE Group SA. Lausanne, 26 November 2013 – Every year, IBS Intelligence publishes a ranking of IT solutions covering various categories (private banking, retail banking, etc.). SAGE Group SA develops Prospero, a range of solutions for the financial sector which accurately responds to the needs of different segments of the financial services industry. 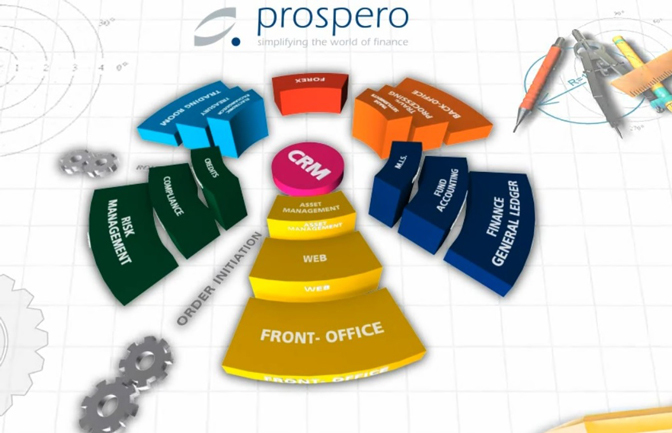 Prospero solutions cover all financial transactions: asset management, fund management, fund administration, independent wealth management / family office and portfolio optimization. These applications allow financial firms to focus on their core business and therefore improve their productivity. In IBS Intelligence’s Sales League Table report released in 2013, SAGE placed 2nd in the area of private banking with its Prospero offering. “We are very pleased to see the strong acceleration on the adoption of our software, Prospero. This trend is symptomatic of a context where customers emphasize price-performance ratio and return on investment,” said Jean-Luc Freymond, CEO of SAGE Group SA. In Switzerland, more than 170,000 individuals are employed in the IT sector, a figure which rivals that of the finance sector and is three times more than the number of individuals employed by the watch making industry. Meet Jean-Luc Freymond, the director of the Swiss company, SAGE Group SA, founded in 1986 and involved in IT management for banks and financial institutions. The company known as SAGE was created in Switzerland in 1986. Initially specialising in the development of Enterprise Resource Planning solutions for large corporations, it made the transition to becoming a banking software provider, about seven years ago. Today it possesses 70 employees and achieved a turnover of 11 million Swiss Francs in 2012. It also has offices in Singapore and Dubai. The company presently focuses on two platforms: The BlackSwan Financial Platform, a risk management and portfolio optimization tool of which a new version is currently being prepared, and the different solutions of the Prospero suite for portfolio management. Jean Luc Freymond, the company’s CEO, provides us with insight on certain features of SAGE as well as his views on the market with a particular focus on the regulatory challenges within the finance sector. He states that the key concern of asset managers is the reduction of compliance costs in order to concentrate on management. Why was the name SAGE chosen, a name which in other words is the same as that of the British software provider created at the beginning of the 1980s? The similarity between the names of both companies is purely coincidental. SAGE is an acronym which stands for Systèmes appliqués à la gestion d’entreprise or Applied Business Management Systems. When our company was created, our British namesake was not as well known then as it is now and its influence had not yet extended beyond the United Kingdom. Since then it has experienced impressive growth although it caters to a completely different category of clients compared to ours. Any possible confusion in this regard is generally cleared up very quickly. What kind of clients does SAGE presently cater to? In Switzerland, SAGE caters to private banks, independent asset managers and family offices. The company Unigestion is one of our long term clients. Our clients outside Switzerland include a certain number of large banks such as Abu Dhabi Commercial Bank. What are the requests of your clients as well as the key trends in IT Management? There is currently a reticence on the part of institutions to engage in large scale projects. They are rather more inclined to seek out solutions to specific problems as doing so involves limited risk and provides a rapid return on investment. Have there been any changes in requirements regarding global solutions such as Cloud for example? There has clearly been a change of mentality with regards to Cloud. It is the sort of solution mainly chosen by small companies which do not possess a well-developed internal infrastructure. Experience has proven that it is more profitable to have a Cloud solution which is governed by existing rules and regulations in the industry and which possesses a highly secure infrastructure, of which the raised costs are shared, rather than a more modest proprietary infrastructure. Another advantage which clients are becoming more aware of is the rapidity with which it can be installed and the fact that it is independent of the availability of resources possessed by their IT departments. In what way are providers of IT solutions taking regulatory changes into account, particularly with regards to the finance sector? The initial perception of regulatory changes is generally negative due to the additional costs that they incur as well as risks in the event of noncompliance. On one hand, we remain alert in order to be able to anticipate the required changes to our systems so as to implement them promptly. On the other hand, we attempt to seek out opportunities which enable us to take advantage of these changes in order to make it possible for our clients to improve their services. For example, the fact that it is obligatory to question the client on their risk profile is beneficial in that it makes it possible to analyse behavioural patterns which can be quite useful for quantitative models. What solutions do you propose that will enable financial institutions to spend more time on management and less on regulatory compliance? Time saved due to implementing effective procedures either during the gathering of information, the transferring of orders, the processing of transactions or the periodic reviewing of records. At each of these stages, we assist users in reducing manual operations and above all the risk of error. We have developed a compliance regulatory programme which participates in the work flow and which alerts the user at each step in the event of any action which risks violating any established regulation.This programme is also combined with a control panel which makes it possible to constantly verify compliance with set regulations. Regarding project implementation, what appeal do traditional procedures hold for clients compared to the Agile procedure developed about 10 years ago? Experience shows that traditional methods of implementation are based on the premise of clients being able to express the totality of their needs at the beginning of the project. However, without entering into communication issues or the interpretation of those needs, their evolution is so rapid that a part of them are already altered during the period required to gather and document them. Agile’s development method which possesses a far greater degree of flexibility has been specifically adapted to software development and implementation within a context of rapid change. What key challenges does IT Management face in the coming years? It is certain that questions relating to data quantity and security will be central to concerns in the years to come. The generalized use of mobile platforms accessible from any location or using any device will result in the need for new means of ensuring data security. On the other hand, the amount of data generated will increase exponentially. The wealth of information contained in “Big Data” hints at very interesting opportunities. It will be useful to establish new kinds of infrastructure to gather, secure, and above all, process data of such quantity. *This article was originally published in French by Marjorie Théry for L’Agefi, the daily economic and financial agency in Geneva, on 28th October 2013. In an interview with Geneva Business News, Jean-Luc Freymond, the CEO and Chairman of SAGE Group SA – a leading Swiss company in financial management technology – speaks of the recent accolades awarded to the company’s products as well as his vision and the means by which he intends to bring it to fruition. The successive crises which have affected the banking and finance industry have resulted in both investors and fund managers seeking for tools which are simple, yet reliable to manage their portfolios. Also sought for, in addition to portfolio management, is an improvement in client – fund manager relations resulting from improved understanding and explanation of financial products. SAGE Group SA is dedicated to revolutionizing the front office interface between investors and financial establishments, a goal which forms the very core of its vision. It has created two product lines of which the first, Prospero, provides software used for wealth management, institutional management and the management of funds (including hedge funds). Prospero provides solutions for each part of its niche market including independent wealth managers, established banks and family offices. In recent months, Prospero has received several accolades particularly from a number of renowned independent stakeholders such as IBS Intelligence and the AITE Group. The more recent product, BlackSwan, is a platform which makes it possible for investors and managers to optimize portfolio returns specifically through loss reduction during extreme market conditions such as the recession. In spite of its elaborate internal mathematical model, BlackSwan is a platform which is both simple and easy to understand and which makes it possible for the user to effectively distribute their investment between different available asset groups – a function which should have required 20 man-years to achieve – a considerable head start on the competition. It has just been recognized by Datamonitor as 2013’s new trend in the area of client – fund manager relations. A notable key function of the product is that it increases the quality of communication during business meetings between the two parties as well as improving the understanding and the management of risks. SAGE Group SA is a promising pioneering firm in a sector in which young investors are interested in obtaining an improved understanding of the contents of their portfolios unlike a significant proportion of mature investors. Geneva Business News: What are your views on the accolades awarded to your products Prospero and BlackSwan? Do you consider them to be the peak of achievement or a source of additional motivation? Jean-Luc Freymond: For a firm like SAGE Group SA that is constantly in search of innovation, the recognition of independent stakeholders such as IBS, AITE and Datamonitor is very important particularly in light of the fact that they are focused on the future and are good observers of key trends! We view these accolades as recognition of the accuracy of our vision and the effectiveness with which it is implemented. It is a confirmation of the fact that we provide real added value to the industry both in terms of innovation and in terms of the relationships we have with our clients. It is also recognition of the work carried out by our staff. These accolades indeed provide additional motivation to innovate and maintain our leadership. SAGE has made a winning connection between the 3 factors which can enable banking establishments to stand out from among the competition. These are: The front office, products and order processing (back office). Geneva Business News: The ‘flexibility’ of your product and rapid investment returns are often mentioned. Could you provide us with factual examples of these? Jean-Luc Freymond: Banking establishments prefer to avoid lengthy and costly projects on which investment returns are not guaranteed. Rapidity on investment returns has become an important criterion by which projects are selected and by which their success is measured, particularly in the present time. Investment returns are measured in terms of business volume growth or cost rationalization. We have thus modified our products in order to respond to these needs. The preconfigured solution we provide incorporates best practices and can be utilized promptly thus enabling our clients to reach their objectives just as rapidly. For example, we installed our solutions in two banks within the space of six months: the first installation was completed within three months and the second within four months. SAGE Group SA has made a winning connection between the 3 factors which can enable banking establishments to stand out from among the competition. These are: The (1) front office, (2) products and (3) order processing (back office). Without a knowledge of the product by the front office, an available comprehension of products or the prompt processing of orders according to clients’ specifications; it would be difficult for an organization to experience an increase in business figures. Our products provide this supplement of flexibility in the value creation chain – flexibility which could become a comparative advantage for a financial establishment. Geneva Business News: SAGE Group SA is a pioneering organization in the area of Cloud solutions for financial establishments. Such services would not have been considered due to security concerns if not for the financial convenience of this particular segment of the market. Is boldness or are gadgets required to stand out from among the competition? Jean-Luc Freymond: Our aim was to provide financial establishments, family offices and independent fund managers with a small-sized first class tool. These stakeholders are not necessarily interested in having an important computing service during the launch of their activities but wish to access our Cloud services almost immediately after becoming our clients. In addition, our robust systems which possess a high level of security provide a first class data processing service to our clients that they would certainly not have been able to install within such a short period of time or at so little cost. It is true on the other hand, that our key clients – who besides, are not our target for this service – initially displayed a certain reticence. However we are unafraid of innovation. Geneva Business News: Your other product, the BlackSwan, which is also a part of the Prospero line is slightly less well known. Jean-Luc Freymond: BlackSwan is a very promising product. Datamonitor has also confirmed that fact. BlackSwan was created to assist investors and fund managers in managing risks in volatile markets as has been the case for some years. Using macroeconomic data that the client can understand – such as levels of unemployment, petrol prices and growth – BlackSwan makes it possible for the investor to understand the evolution of their portfolio in relation to these parameters and thus participate in managing risks linked to it. It is in this sense that BlackSwan improves the quality of communication between the investor and the fund manager. These discussions become truly interactive because both partners are able to use common parameters. It is a minute revolution within the banking sector long accustomed to using risk management mathematical models hitherto understood by a handful of employees. BlackSwan is a solid guarantee in improving risk management. Geneva Business News: Real time trading risks are often mentioned. The BlackSwan platform must evidently be considered in the issue of trading, does it not however somewhat contribute to the impersonalization of the financial process? Jean-Luc Freymond: Not at all! BlackSwan is a long term management tool which makes it possible to optimize portfolio returns based on macroeconomic data which is essentially a long term strategy compared to real time trading. Geneva Business News: What are the comparative advantages that you have at present? Jean-Luc Freymond: The fact that our service is preconfigured makes it possible for it to be installed within a short period of time. Additionally, our partnerships with technology and data providers make it possible for us to conceal the true extent of the complexity of our solutions from our clients so that they are perceived as being simple and easy to set up. Our services integrate all the necessary licences thus saving the client the trouble of having to negotiate with each provider. Our strategy for Front Office improvement has made it possible for us to anticipate the need for investors and managers to communicate through the use of parameters they can both understand – a leadership in innovation which has been recognised as mentioned earlier. Finally, few stakeholders can claim to have our knowledge of this market in the 3 key regions for future growth in the financial sector, namely: Asia, the Middle East and Europe. All these elements contribute to the uniqueness of our service. Geneva Business News: SAGE Group SA is currently present in Europe, the Middle East and Asia. You have 2 product lines. Will they be sufficient to ensure sustainable growth? What are your growth levers for the future? Jean-Luc Freymond: The 3 regions have a potential for growth that is already absolutely phenomenal. This industry is experiencing a period of profound change from pressure for regulatory hypertrophy, pressure on offshore products, transfer of wealth to the East, and a younger generation of investors whose relationships with their bankers are completely different from those maintained by the older generation with theirs. This dynamic gives rise to new opportunities and motivates us to further concentrate on our niche and to endeavour to understand these changes in order to provide solutions which remain innovative and capable of ensuring the prosperity of our clients and of ours as a result. That is our strategy. Geneva Business News: You seem to be avoiding the American market. Is this due to a desire to concentrate on markets in which you are already influential or because you wish to avoid problems even though you are not a bank? Jean-Luc Freymond: We are not exposed to the same risks as banks. As I have already stated, the potential of the markets we are currently concentrating on is enormous and we want to avoid spreading ourselves too thin and losing our closeness with our clients as a result. Geneva Business News: What future developments do you envisage for your products? Jean-Luc Freymond: We are working on a development which optimizes the presentation layer for touch screens for both Prospero and BlackSwan. Our software already operates on these screens but we wish to improve their ergonomy. Specifically for BlackSwan, we intend to add features which make it possible to measure risks more effectively for non-banking asset groups such as real estate and private equity. An example of risk is risk linked to a lack of liquidity. Still within the perspective of improving the relationships between investors and their banks, we intend to equip BlackSwan with search results on long term and sustainable investments once they have come to maturity. Geneva Business News: Where do you see yourselves in 5 years? Jean-Luc Freymond: In 5 years, I envisage a business experiencing significant growth which will have improved its share of the market and the ergonomy of its products. I also envisage a key part of our revenue coming from an Internet self-service feature which makes it possible for investors to register with us online and gain access to our services without having to contact our staff first of all. That is going to be our new distribution channel. Geneva Business News: How does an organization like SAGE Group SA manage its human capital, namely, its staff? How are they recruited and what do you do to keep them? Jean-Luc Freymond: Our employees are our most important asset and we are proud of our very low staff turnover which is due to a combination of 2 factors: the importance we place on sharing our values from the outset and the creation of a variety of motivating challenges throughout the careers of our employees. An Entrepreneur in search of key trends and sources of added value. Geneva Business News: You possess a background which although unusual is no less original: Business management, law and information systems. What have been the keys to your ability to adapt to these different areas? Jean-Luc Freymond: When I look at my experience, the single factor which has always motivated me is the desire to improve the area within which I function. In order to improve my ability to adapt and my quest for added value, it is necessary for me to analyze and understand key trends, hence the significant amount of time I dedicate to reading and the perfecting of my professional experience. Another tool which I have found to be of great importance is the Entrepreneurs’ Organization which I am a member of and which provides a unique framework for the sharing of experience. This organization offers a significant amount of continuous training. It is as a result of it that I completed a Master’s programme at the Massachusetts Institute of Technology (MIT). Jean-Luc Freymond: There are two things I do to unwind. First of all, I dedicate one hour between the hours of six and seven a.m. to sports activities, which enables me to begin the day in a dynamic and motivated manner. Secondly, I also follow a certain lifestyle which includes managing the transition between my professional and private life while commuting between my home and my place of work. When at the workplace, I concentrate on work related issues and concentrate completely on my family when with them. Prior to becoming the CEO and Chairman of SAGE Group SA, Jean-Luc Freymond was one of the principal architects of Prospero, the banking and financial management software suite developed by the organization. Prior to joining SAGE, Jean-Luc worked for UBS and already possessed more than 14 years of experience in system development and in project management in the banking sector. He was also responsible for the successful completion of several large scale projects through the effective management of teams composed of both developers and analysts. He shares his experience by giving banking technology courses at the University of Lausanne and by participating in expert forums and webinars in this area. He is also an active member of the Entrepreneurs’ Organization. Bilingual in French and English, Jean-Luc possesses a BA in Management and a postgraduate diploma in European Law, both obtained from the University of Lausanne. He also possesses a Masters Degree in Entrepreneurship obtained from the Massachusetts Institute of Technology (MIT). *This article was originally published in French by Constant Gbaguidi for Geneva Business News on 25th June 2013. Amir Suleman has joined SAGE Group SA as the Head of Sales (Middle East) for its Dubai office. SAGE Group SA, a Swiss company, is dedicated to help private banks, independent asset managers (IAMs) and family offices serve their clients better and more efficiently in today’s fast-changing business and regulatory environment. With almost 12 years of experience in the field of banking technology, Amir will cover the GCC countries and the rest of MENA. He previously held the positions of Sales Director for Middle East at Sungard and Head of Business Development for Middle East at eFront. For more information on this news, please contact SAGE at +971 4 428 13 85 (Dubai). About 60 ground-breaking businesses in the Banking and Finance industry showcased their latest developments during the Finovate conference held in London over a period of two days. Our editing team was able to gain some insight on the banks and the Swiss developers present at the conference and reviewed a number of new ideas during the conference, ranging from mobile services to Foreign Exchange. It was a heterogeneous group of individuals that gathered on a cold morning in a Victorian building situated in Old Billingsgate, at the heart of the City district. Bankers, investors, entrepreneurs and other consultants had come to attend the Finovate European Conference featuring the latest and most effective technological innovations in the Banking and Finance sector. The organizers had prepared an intensive programme with approximately 60 presentations in two days, a sure sign of a field enjoying rapid growth. Established organizations and start-up businesses that had been selected were allocated a time limit of seven minutes each to present their products and win over their audience, with the presentations being halted once their time limit has been exceeded. The enthusiasm of innovative entrepreneurs in participating and thus obtaining opportunities for establishing essential contacts with potential clients, investors and partners, while enjoying a high level of visibility, was not dampened by the tight schedule imposed. Four Swiss IT organizations present at Finovate were all established vendors who had come to unveil their latest technologies. SAGE Group SA, a company based in Lausanne (not to be confused with the developer of ERP) had also made the journey to London in order to unveil its new portfolio management tool, BlackSwan Financial Platform, whose outstanding feature is its ability to incorporate indicators capable of providing clients with more information compared to means generally employed by professionals. “With an advisor, a banking client could, for example, simulate and visualise risks and performance forecasts of their portfolio in relation to the change in economic growth in a particular region”, Jean-Luc Freymond, the CEO of SAGE Group SA, explained during his presentation. Few Swiss bankers took centre stage during the conference, with the majority forming a part of the audience.Among them were certain representatives of Swiss organizations. Bogdan Iancu, a representative of web based operations at the Banque Cantonale Vaudoise explained that he was there to observe and update his superiors on the technological innovations presented, stating: “We are interested in PFM, although it is not our aim to pioneer new technologies”? Representing UBS were Urs Wagner and Andreas von Criegern, respectively involved in e-banking and web strategy at the bank. They too had no interest in pioneering new technologies but were interested in new developments. “We are investing in e-banking and mobile services, however the attachment of clients to advice and more traditional channels of communication cannot be forgotten,” they explained. When asked which was more difficult between being convinced by start-up enterprises and convincing their superiors, the two representatives merely smiled in response. It is worth noting that technological innovations are not a priority for Swiss banks. A study carried out by Ernst and Young in December 2012 involving 120 Swiss banks revealed that their priority themes for 2013 included conformity, equity planning (Basel III) and fiscal transparency. Investment in new technologies was relegated to the background.Furthermore, although the Swiss banks foresaw a sharp fall in customer loyalty, 70% of them held the view that external competitors within the sector would not pose any threat to their market position by 2020.Tariffs for banking services were expected to become more transparent but not more profitable.Which is worth reflecting on. *This news was written by Rodolphe Koller and published in French by ICT Journal. Published text translated in English has been shortened for its significance to SAGE Group SA. Together with the erosion of banking secrecy, regulatory changes have increased the pressure on asset managers’ profit margins. As a consequence, these institutions have been forced to look for ways to improve their value proposition.In this context, various technological advances directly designed for private wealth management have emerged. These new tools suggest scenarios in which financial institutions can distinguish themselves using technology. While one cannot underestimate the importance a relationship manager plays in creating customer satisfaction, their performance is only as good as the tools available to them. Customers have become accustomed to having a multitude of online services available in their everyday lives; they expect to see the status of their investments in real time, preferably on their mobile tablet. This trend is creating the conditions to rethink the interaction between relationship manager and investors. For example, by allowing the customer to examine the important events related to their account (such as the performance of their portfolio) before each appointment, the manager significantly reduces the need to explain past information to the customer and can dedicate more time to the real issues that the customer has. This creates a more useful report for the customer because it enables him to clearly visualize the opportunities and risks associated with his investments. As a result, the customer has a better understanding of the ins and outs of his decisions, and he accepts the consequences of those decisions more readily. This transparent approach to account management can strengthen the trust in the manager-customer relationship. With the increase in market volatility, and the need to generate absolute returns after taxes, customers expect to get evidence of a systematic process aimed at reducing their risk. Given the abstract nature of the notion of risk and the complexity of the quantitative models that they involve, it is essential to use intuitive settings and scenarios to get investor’s buy-in on the investment decisions. One method is to establish a set of factors that are meaningful to the investor, such as GDP growth, inflation or the price of oil. These factors should include all the variables that the investor wishes to be exposed to and those against which he wishes to hedge himself. Based on these elements, the portfolio optimization tool BlackSwan Financial Platform creates the conditions for an interactive discussion of the options available to the customer using a set of intuitive indicators which one can use to observe the impact on the portfolio in real time. The main advantage of this type of analysis is that it enables the construction of a portfolio that matches the client’s strategic concerns and particular hedging requirements. In addition, it provides a better understanding of how a portfolio is composed. Thus, the act of investing is no longer to buy products or to comply with a predetermined asset allocation, but rather to have exposure to risks for which the investor wishes to be rewarded. It is obvious that in order for the Swiss financial industry to maintain its global standing, it must compensate one way or another for the loss of the competitive advantage that it formerly enjoyed from its banking secrecy. As we have shown, opportunities exist: by arming themselves with effective tools, Swiss asset managers can build a solid reputation through their superior management of risk.